It used to be that spotting a "good" counterfeit bill was impossible for ordinary people. If it was good enough to pass the "look and feel" test, then it was going to take an ultraviolet light or a magnetic ink detector. But for the past 10 years, the Bureau of Engraving and Printing has been making bills that are easy to check. This is as far as most people go, and it's good enough most of the time. U.S. bank notes are printed on special paper that's 75% cotton and 25% linen. The linen gives it an extra stiffness that's distinctive. There are also red and blue fibers imbedded in the paper. Bank notes are printed with a process called "intaglio" that leaves ink on top of the paper, giving the money a distinctive texture. The printing is also very high quality, so the lines are sharp and clear, not broken, fuzzy, or blobby. Bank notes bigger than the $5 use color-shifting ink to print the number showing the denomination in the lower-right-hand corner. Just look at the numbers head-on, and then from an angle. For genuine notes the color will shift (copper-to-green or green-to-black). You can get this far pretty discreetly. The look and feel you're checking automatically as soon as the bill is handed to you, and you can confirm the color-shifting ink in a quick glance. Going further will require that you hold the note up to the light — which is basically saying that you think you might have gotten counterfeit money. A lot of people hesitate to do that, but it's the next step if you want to be sure. All bills bigger than a $2 now have a watermark — hold the bill up to the light to see it. For the $10, $20, $50, and $100, the image matches the portrait. That's also true of the current $5 bill, but on the new $5 coming out in early 2008, the watermark will be a big numeral 5. 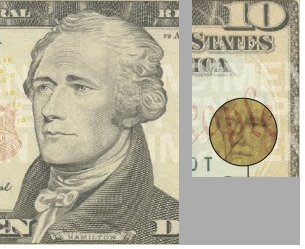 Either way, you can use it to spot bills that have been bleached and reprinted with a higher denomination. The watermark is part of the paper and is visible from the rear of the note as well. All bills bigger than a $2 have a security thread running vertically through the bill. Like the watermark, you hold the bill up to the light to see it. then it's almost certainly a genuine bill. There are still some old bills around, from before these security features were added (starting in 1996). Now that it's been more than 10 years, it's about time to simply refuse to accept old bills. Bills that old, that are still in circulation — especially high-denomination bills — are much too likely to be counterfeit. If it is genuine, the holder can easily enough take it to the bank and get some new currency, so your refusing to take it is no burden on an an innocent holder of old but genuine currency. The U.S. Secret Service page on spotting counterfeit money — This page covers spotting counterfeits the old-fashioned way, without using the security features of modern bills. The How Stuff Works article How Counterfeiting Works — This page actually walks you through making your own counterfeit with a scanner and a color printer. It explains why it's harder than it looks and how most counterfeiters are usually caught and sent to prison for a long time. An article from the St. Louis Federal Reserve: Currency Design in the United States and Abroad: Counterfeit Deterrence and Visual Accessibility (PDF) — On how different countries have tried to optimize the trade-offs between fighting counterfeiting, making their money accessible to people with limited vision, and making the money easy for banks and other high-volume users of currency to handle. I used to do all of those in one foul swoop, except for putting them under a blacklight(although i could have if i wanted to turn around). Instead of holding it up in the air, and possibly making a customer get annoyed that you dont beleive its real, I would just hold it up to the computer screen that was in front of me and used its light to shine through it. It would be right there and i didnt have to move any extra to check all of the security features. sure, i doubt everyone has a brightly colored screen in front of them, but if you do, and are as lazy/cautious about their reactions, thats something to think about. I was on a plane once looking through the Skymall and saw an ad for a counterfeit money detection kit aimed at business owners. (Maybe this one) where they said "If you are worried about having a bank teller confiscate counterfeit bills in your deposits then this is the right tool for your business." Note that the emphasis isn't on not *accepting* counterfeit money, but on detecting it before you pass it on the bank. The clear implication that the business owner could circulate it back out to the public. Creepy. While it is correct that you are not legally obligated to take them (http://answers.google.com/answers/threadview?id=281625), this would certainly introduce a lot of ill will in your customers if you adopted this policy at your business. I get older bills ALL OF THE TIME and I'm sure a lot of others do too. Usually not out of the ATM, but from other businesses as change. If you're going to make me "take it to the bank", I'm just going to take my business elsewhere. Yes old bills are still legal tender and rejecting them would certainly be bad for business. Not only would it be bad for business, but I believe it's also against the law to refuse any genuine federal bank note. I guess I was thinking of ordinary individuals who might be receiving dubious bills from a business, or from another individual, when I suggested refusing to accept old bills. A business (at least, one in a fixed location) is in a much better position than an individual to do a careful check--for example, using a UV light--so they shouldn't need to turn money back unless they have good reason to think it actually is counterfeit. Good tips. I was aware of new security measuress on new bills and some are quite obvious but I ws not aware of the color shifting or the security thread. If a counterfeit banknote ever passed through my hands, I didn't notice it, and no one I know has ever mentioned getting one, so they're obviously pretty scarce in the US as well. Of course that one statistic doesn't tell the whole story. Lots of countefeits are noticed before they reach the central bank--spotted by a cashier or a bank teller. Other counterfeit notes may well be out there, but circulating in a way that keeps them out of banks. Still, six (or even eight) out of a million is a comfortably low number. Low enough to justify the extremely casual attitude that most people have to accepting a bank note with no more than the "look and feel" test. There are several counterfeit money detector on cheap price which can detect counterfeit money easily. I have purchased from http://www.catchfrauds.com on $64.95 only. Everything single dollar that issues forth from the Federal Reserve is counterfeit in the sense that it is nothing more than a piece of paper. Federal money isn't backed up by anything other than the mutual illusion that it has value. A "mutual illusion?" That's just dumb. Actually, he is right, our money is not backed by anything other than the willingness of the buisness to accept it for a certain amount of goods. confident that it can use it to buy itself some goods. there is no other backing attribute. It used to be that the dollar bill was backed by an equal piece of gold held in the reserve. but ever since the great depression, we have changed, and now, if the dollar says that it is a dollar... it is a dollar. Heck of alot easier than the barter system. I mean everybody needs money. But in the barter system, if you have two tour buses and you need a house to live in and there is no single dependent currency. what would make you think that the contractor would be willing to accept your two tour buses to build you a house. He does not need them, so you would have no way to pay him, so you would have no home. First, it's never illegal to refuse to accept money that you think might be counterfeit. In fact, it's the only sensible thing to do--if you accept it, you lose: you can't pass it on (passing counterfeit money is a crime) and nobody is going to replace it with good money. Second, it's entirely legal to insist that payment be made in some specific form--almost any form you want--during the transaction. You can say "No $50s or $100s." You can say, "Exact change only." You can say "Checks only" (my apartment office does, so they're not in the position of having large sums of cash in the office on the day that rent is due). Those are all common, but you can legally make any restrictions you want how how people pay you. You could insist that people pay in quarters, or in $2 bills--or in anything except quarters or $2 bills. You'd probably lose some customers, but it would be perfectly legal. This all follows from the fact that you're not required to do business with any particular customer, so refusing to serve a guy who wants to pay with a $100 bill is no different from refusing to serve a guy who's not wearing shoes or who's smoking a stinky cigar or who's talking on a cell phone. The only place where any of this gets at all tricky is when someone offers cash to settle a debt. The "legal tender" verbage on bank notes dates from the days when some money was backed by gold or silver and other money wasn't. The legal tender laws said that you couldn't insist on customers paying with actual gold or silver: if they offered payment in "lawful money" of the United States, you had to take it. (But only, of course, for an actual debt--if the transaction hadn't occured yet, there wasn't any debt. As part of the transaction you could establish any payment terms you wanted. You could insist on payment in beaver pelts, if you wanted.) The law was changed in 1974 and you can once again write contracts that require payment in actual gold or silver. It's generally bad business, of course, to refuse to take your customer's money--but businesses are in a better position to deal with this risk than their customers. If they large volumes of business in cash, they can give their cashiers the ultraviolet lights and magnetic ink detectors that will let them check the bills they receive. But the ordinary guy on the street doesn't have such tools. He's forced to rely on the security features described above--which is why I think it's perfectly reasonable for him to start refusing to accept old bills. The guy who has old bills can easily enough take them to his bank, which can verify their authenticity and replace them with new bills. I doubt if most employers try to stick their employees for the bad currency that they take. Most places, counterfeits aren't enough of a problem to be worth the hassle. Still, it's technically up to whatever the agreement is between the employee and the employer. In any case, the employer could certainly fire employees who carelessly took counterfeits, especially if they were supposed to check and didn't. I understand and agree with what the guest in comment #11 is saying. This country doesn't have enough actual gold and silver to back each of the notes that are printed. That's why most of our transactions are becoming cashless ones. Our paper money only has value, because we all agree that it does. We receive it as payment for our jobs and it's accepted as payment for goods. We consider it "legal tender", because the government printed it and the words "legal tender" are printed on it. I hope this helps the guest in comment #12. I would like to add that I'm grateful for the new changes to our money, which helps to keep people from printing their own. Ever wonder who designs the paper and security features that legal banknotes are printed on? Check out the blog www.globalpapersecurity.com to learn about banknote production. I understand what #11 said, but I disagree, it's not an illusion that I can pay for $100 worth of stuff with a $100 bill. It's called Fiat Money, and yes, while the paper it's printed on is inherently worthless, it is still valuable as a currency none the less. Its value is no illusion. #18 you almost get it, Fiat Money works because we contract in it (businesses receive it as payment and we receive it as payment for our labor, like you said), not because the government says its legal tender. Gold doesn't back our money because the gold standard failed, it just doesn't work. The reason most transactions are becoming cashless is because it's just easier, it has nothing to do with gold and silver. It's much easier to add and subtract numbers on a computer than it is to mess with currency and coin. Food for thought: when good ol' Uncle Sam and the Fed decided to bail-out AIG and Wall Street, did they print up 700 billion dollars in brand new money? Nope, the money supply did not change. All they did was add zeroes to whatever account they were funding. There was never any cash that phyiscally exchanged hands or was created. "All they did was add zeroes to whatever account they were funding." You don't see any negative consequence from this expansion of the money supply? When too much "money" is supplied an economic phenomenon happens whereby the price of every good adjusts upward to absorb this excess, this price inflation from monetary inflation then starts a vicious circle of more printing whereby people lose faith that the "value" of their dollar is stable from year to year, month to month, week to week, ultimately day to day. Ultimately the govt. puts futile wage and price controls that exacerbate the problem. That is when people eventually come to realize the paper their money is printed on is worthless and they won't exchange it at all. If you want to see what the "adding of zeroes" does to a currency check out South American countries, Zimbabwe, Weimar Germany, etc., etc. etc. The result is always the same, the U.S. will be no different. Gold was not a failure, it worked wonderfully to back american currency for 150 years. The paper money could be traded and changed easier, but it was just essentially a bank RECIEPT for the real money in your account - gold and silver. Our greatest founding fathers warned of fiat money... and guess what? They were right - you just have no breadth of historical knowledge to understand the dire situation we are in. It has taken less than one man's lifetime for the country to go from the most prosperous on earth to the largest debtor nation in world history - we are in the final death spiral of the dollar. heck if it is as simple as adding zeros they should do that to my bank account too. "The law was changed in 1974 and you can once again write contracts that require payment in actual gold or silver." Guess what happens when you go to court to collect on your gold payment. As a former cab driver, I often had to accept cash in low-light conditions. However, the "feel-factor" is almost completely fool-proof. Real cash cannot be torn as easily as counterfeit money (a tiny corner of the bill will do), nor does it crumple like standard paper. If I really thought I had a problem, a quick glance while holding up to the interior light would confirm my suspicions one way or the other. However, this was an extremely rare occurence in my case. I never had a problem with the monies I received. However, a person skipping on their fare by running out of the car was more of a problem, but not one I need to address here. I did learn how to avoid such situations, but that is a trick of the trade I am unwilling to pass along to the general public! You can't refuse money unless you can show its counterfeit. Says right on it thats its legal tender for all debts, public and private. If you don't have change, you cant refuse it if the other party doesnt want change. Sure you can. In fact, if you think the paper might be counterfeit, refusing to accept it is the only reasonable thing to do. The legal tender statement on the paper dates back to the days when paper circulated together with gold and silver. It meant that you couldn't insist on payment in precious metal, but had to accept the lawful money of the United States. But not if it were counterfeit, of course. And in any case, you're always free to specify reasonable time, place, and manner conditions on accepting payment. For example, if someone wants to pay a large debt in the form of cash, it would be perfectly reasonable for you to insist that payment be made at a nearby bank (where you could have the bank check that the paper wasn't counterfeit, and then deposit the money immediately). Great article! We own a busy seasonal pizza and sub shop in a resort town. I have all my employees, who are also cashiers, read it and do it. We haven't seen a counterfeit since. Customers joke, when they see us put a bill up to the light, but all I say is,"If this was your cash register, you'd check them, too" They agree. Thanks!!! I'm not sure what legalities you may be citing but most of your OPINIONS are completely misinformed. So, I'll go ahead and clear things up so you do not butcher everyone's mind too badly. It is illegal to make one customer pay for a good or service in a specific way but allow the next customer purchasing the same good or service to pay how they please. That being said, if you make a transaction to customer A, who buys product A, and refuse to make a transaction to customer B, who wants product A because you think customer B is passing counterfeit bills, then that is illegal. In fact, if you deny the transaction without giving the customer a reason, that is illegal. So, what if you tell them you believe the bill is counterfeit and give them the money back and cancel the transaction? Illegal! Any bill believed to be counterfeit is to be immediately confiscated and local authorities called, who will in-turn, contact the appropriate agencies. Because you believed the bill was counterfeit, and then released it back into circulation, you are only aiding the problem as well as making yourself liable, because you received counterfeit bills, knew they were counterfeit and then passed them back to the same person. Just because you are passing money back and forth between you and the customer doesn't seem like it is illegal but it is indeed a transaction, even if just implied or verbal. Which can also be classified intent to distribute, knowingly receiving fraudulent bills, knowingly aiding in passing counterfeit bills and if enough exchanges occur, then im sure you could classify that as laundering! Please get your facts together Philip. Your blog is irrelevant and cites information that is based on your opinions from reading and interpreting statistical data. Not to mention that you feel the need to reply to everyone else's comments! Its a comment section; not a Q and A session. I have a question, if a customer unknowingly pays for a product or service with a counterfeit bill they received as change from a previous merchant, and the merchant for the current transaction checks the bill and confirms it is counterfeit, what are they required to do? I wouldn't think they would be allowed to return the bill to the customer, even if the product or service hadn't been rendered yet. However, now the innocent customer is out the money [whatever the denomination of the bill in question was]. What relief would they have?